It’s that time again! National Eating Disorder Awareness Week. What is NEDAwareness Week and why is it important you ask? I’m glad you asked. Bringing focus to eating disorders is more than just showing support for those who are struggling with anorexia, bulimia and binge eating disorder. The intention here is to show just how pervasive eating disorders are and how much support there is for eating disorders in our culture. Yes, eating disorders are supported, not recovery. You can see it everywhere. You can see it when you turn on reality television, you can see it in a yogurt commercials or cereal commercials when you are encouraged to give up a meal and replace it with this artificially flavored yogurt or processed cereal to lose weight. You are supporting eating disorders when you sit around with people and talk about how fat you are and what your next diet is or when you start to discuss someone else’s weight gain or weight loss. All of this behavior supports eating disorders by reinforcing the idea that you are not okay as you are, that you have to do something dramatic to change yourself. 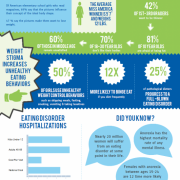 How can you support National Eating Disorder Awareness? 2. Don’t buy women’s magazines, especially diet magazines that are disguised as health magazines. EDNOS- The Deadliest Disease… What does that Mean? So lots of people have been sending me this clip and asking me to comment on it. This is a great clip, if a little sensationalized. First off, I want to comment on the “Ednos is the deadliest eating disorder, even more deadly than anorexia, even more deadly than bulimia.” So I want to clarify here, EDNOS stands for “Eating Disorder Not Otherwise Specified,” and really, it’s main purpose is for coding and billing. Anorexia and bulimia have a very specific set of diagnostic criteria. 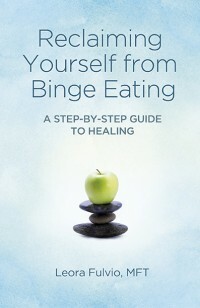 For instance, to be diagnosed with bulimia, you are bingeing and purging twice a week for at least three months. So what if I had a client who was purging daily for the last month? She’d be EDNOS. But she’d still be bulimic. And what if I had a client who vomited every week, but usually just once a week, and she’d been doing it for years. What if she also binged, then overexercised, but restricted most of the time? What if she’d lost her period, but her weight wasn’t 85% of her expected weight? Then she’d be EDNOS for diagnostic purposes. She wouldn’t fit into a diagnostic criteria for anorexia or bulimia. What if I had a client who binged on cookies and ice cream several times a week, then compensated by not eating the next day. She’d have Binge Eating Disorder, but until 2013, there’s no DSM diagnosis, so she’d have EDNOS. So, the misleading sensationalism about “EDNOS, the most deadly disease that is the most common that no one ever talks about…” is really just a catch all phrase for your typical eating disorder. Most EDs just don’t fall into the diagnostic criteria neatly. They’re really complicated. Which is why most people with eating disorders are diagnosed with Eating Disorder Not Otherwise Specified.Now, other than my criticism of that, I liked the clip. It’s a good description of what happens with an eating disorder. It starts as restricting, gets more and more severe, turns into bingeing, which can then turn into bulimia… I liked the clip with the therapist who sat with Taylor and checked in with her after she finished her pizza, I liked how honest Taylor was about how difficult it was for her to eat the pizza. I liked how they brought eating disorders out of the clinics and explained how confusing and scary they really are. Overall, it was good to see. I’m glad that EDs and recovery are getting some attention. It was super courageous of those two women to go on national television and discuss their eating disorders. What did you think of this clip?